I love mincepies and I love cupcakes, so one day when I had a quiet few minutes I thought that it’d be a good idea to combine the two. A family review of this recipe was “tastes just like a mincepie but without the mouthful of dry pastry”. I am taking that as a compliment and not a critique of my mincepie baking. Its a very simple recipe to do and you can decorate them as Christmassy as you like! This recipe made 11 huge cupcakes for me as I baked them in a muffin case. In a large bowl beat the sugars and margarine together till they become lighter. Mix the cinnamon and nutmeg together with the flour. Add an egg and a third of the flour to the sugar and margarine and mix till just combined, do the same with the other eggs and flour. Try not to overbeat your mixture as this will cause the cupcakes to have too much air and dome up when cooking. Into each cake case add half a tablespoon of the mixture so it covers the bottom of the case then put half a teaspoon of mincemeat in the middle. Cover with another half tablespoon of cake mixture. If you are using small cases then change the amount so it fits, you want to have the cake cakes approx. 3/4 full. Bake in the oven for at least 20 minutes, mine took 27 minutes to cook as they were large sized. You can test after 20 minutes by pressing gently on the top, if they spring back up then they are done. Cool the cakes on a wire rack. You can use this time to either have a cuppa tea or start your buttercream. In a large bowl add two big tablespoons of butter or margarine (butter is best but if you only have marg then it’ll still work). Sift in at least 4 large tablespoons of icing sugar and a teaspoon of your chosen flavouring. Very, very slowly mix it all together. Once combined you can add more icing sugar. Add as much as you need till you reach the required taste and consistency. Decorate with the most festive decorations you feel like! I used red, green and gold flakes and a small icing disc with a snowflake pattern. At the weekend I went to the brilliant Cake International show at the NEC. I didn’t plan to spend much money or really buy anything but I couldn’t help myself because of the amazing things to buy and ended up coming home with a lot lighter purse but a much heavier bag! Something I bought was a complete impulse purchase and not what I would usually go for – flavoured icing sugar and cocoa powder. The problem was that the ladies at the Sugar and Crumbs stall were so nice to talk to and gave you so many free samples that I was completely hooked, but I can tell you that it is one purchase I definitely don’t regret buying after using their product to make some Black cherry & Chocolate cupcakes. I bought and used the Black Cherry Cocoa powder as you don’t usually see cherry extract in the shops; although it is more expensive than your usual cocoa powder the flavour is fantastic and you only need to use a very small amount to make a lovely tasting cake that does actually taste of cherry. I often find with some flavoured products that the taste is very artificial, this one isn’t. Now I am not being paid (I wish!) or been given anything else to endorse this product, I am doing so simply because it tastes fab and I would like more people to enjoy baking with it. Next up, I cant wait to try the Christmas Punch flavoured icing sugar I bought… now what to make with it? This recipe is stupidly simple to make but the taste will make you smile. Don’t be fooled by the skull and crossbones icing! In a bowl cream the sugar and margarine till it becomes pale. Combine the Cocoa and flour together in a separate bowl. Add one egg and half of the flour/cocoa, try not to overwork this. Add the second egg and rest of the flour/cocoa. Divide the mixture into your cake cases and bake in the oven till the tops of the cake spring back after a gentle poke. This should take 18-20 minutes. Once cooked, cool on a wire rack. 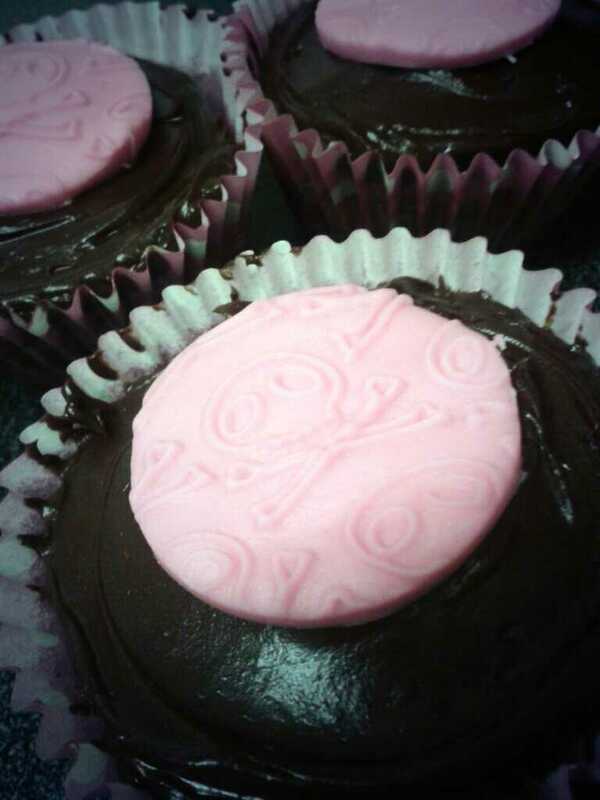 Decorate with your choice of topping if you like: buttercream, fondant icing, chocolate ganache or just leave plain. I had really intended to post this on Halloween but as usual the time has completely ran away from me and before I realised it is over a week into November. It might be a bit late but I was really happy with the way these came out and they were so easy to do that I wanted to share the recipe so that everyone can make them. 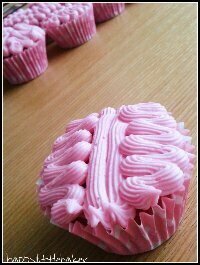 No one can say that baking doesn’t make you clever, after making these you’ll feel very brainy! Hehe. This recipe will make 12 average size cupcakes or 9 larger muffin ones (larger will need longer cooking). Red or Pink Gel food colouring (if using liquid colour then do not add the milk) I used claret gel colour. In a bowl cream the butter, sugar and margarine till it becomes pale. Mix in the food colouring till completely combined. Add one egg and half of the flour, try not to overwork this. Add the second egg and rest of the flour. Stir in the milk (if using gel colour) and the strawberry essence. You should now have a lovely very vibrant colour. The colour should be brighter than you think it needs to be as it will lose some colour once baked. 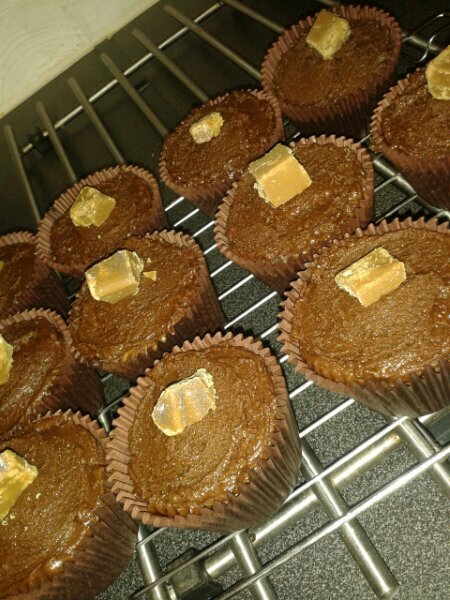 Whilst the cakes are cooling make the buttercream. The best way to make the buttercream is by taste. Add 2-3 large tablespoons of butter or margarine in a bowl and stir in 3-5 tablespoons of icing sugar and a enough food colouring to give it a very bright pink colour. If you think it needs a little more icing sugar then add more to taste. You’ll be surprised how much icing sugar you can add to a buttercream. 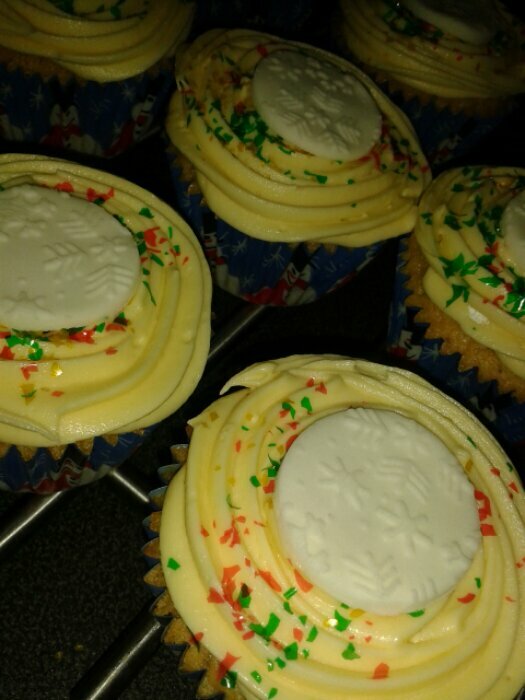 Once the cakes have cooled fully, fill a piping bag with a small star nozzle. To decorate – pipe 2 lines down the centre of the cake the either side pipe tight zigzags. This will give you a lovely brain look! Experiment with colours and zombie brains, I’d love to see any pictures if you make some. Unfortunately I haven’t had too much time, since returning to work from maternity leave, to do much baking recently… but I have tried. I’ve been concentrating on my ideas for my recipe book and luckily returning to work has given me a chance to have lots of unsuspecting guinea pigs colleagues to test my new creations on. Writing a cook book will definitely be a slow process the way I am doing it but it will come together one day. Besides, I’m in no rush. 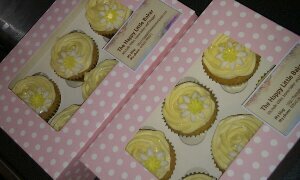 It was my sister and brother in laws first wedding anniversary about 2 weeks ago and so I had really planned to make them a couple of boxes of their wedding cupcakes I made last year. Unfortunately, I was poorly (which, due to everyone else getting ill, I realised was tonsillitis) and it never happened. So this week when we went down for their house warming BBQ I decided to get to it and make them. 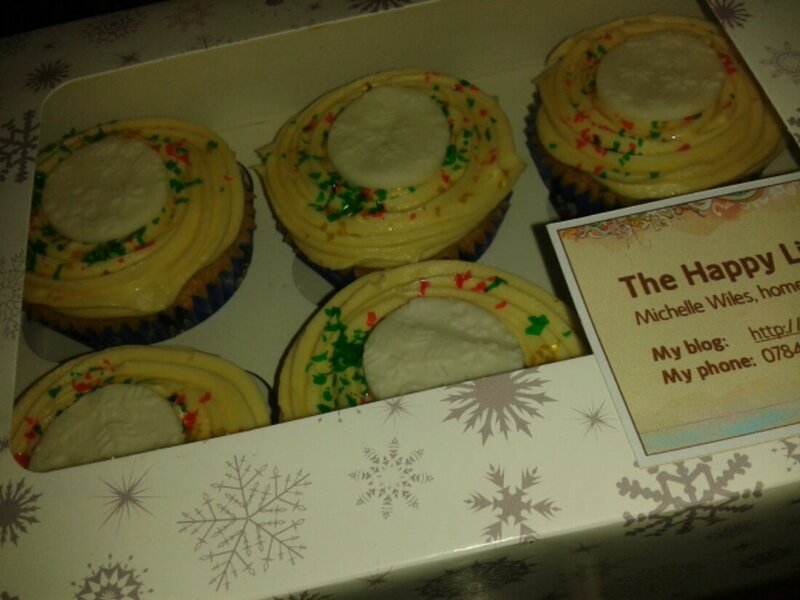 It might have been a couple of weeks late but everyone was very happy to eat them and it was nice to re-do them again as they look so pretty.